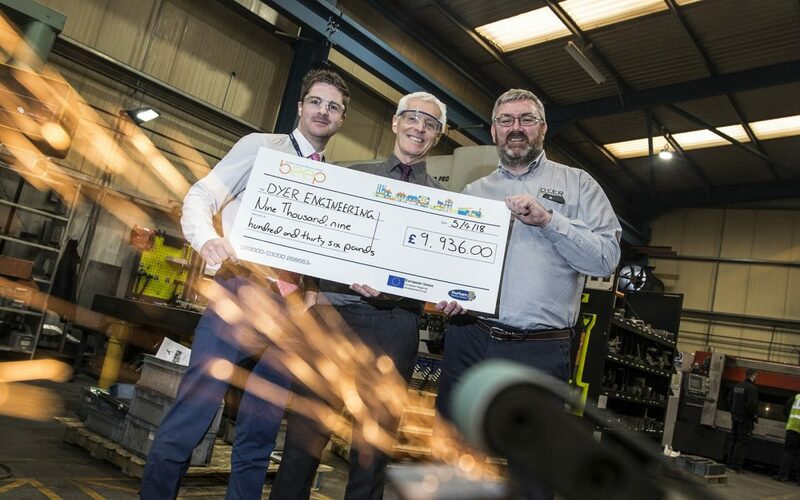 County Durham-based business Dyer Engineering has seen the energy efficiency light after reducing its energy costs by thousands thanks to advice and grant funding from a council-led project. The Business Energy Efficiency Project (BEEP), led by Durham County Council and supported by the European Regional Development Fund, aims help small businesses in County Durham save money by reducing their energy consumption. Dyer Engineering contacted BEEP to take advantage of a free energy audit to identify where it could make savings across its seven production facilities. After completing an audit on premises and equipment, the BEEP team found that replacing the existing lighting across the production facilities would be the most cost-effective area for improvement. The lights were running 24 hours a day, Monday to Saturday, incurring significant costs each year. Following the advice given by the BEEP team, Dyer Engineering collaborated with Carbon8Lighting to replace the original fittings with a range of specialised Discus Gen2 high bay fittings, bespoke to the differing range of workshops. The new efficient fittings mean Dyer Engineering is benefiting from a saving of around £30,000 in annual energy costs. The company’s total lighting related energy consumption has reduced by more than 220,000kWh per year. Dyer Engineering was awarded a £9,954 grant from BEEP to help reduce the payback period of its LED lighting improvements to under 12 months. Graeme Parkins, managing director at Dyer Engineering said: “The BEEP team have been great. The process was quick, straightforward and reliable – everything you want when you’re running a busy business. Furthermore the improvement to the quality of light has been remarkable”. Calum Baker, BEEP project manager said: “We were delighted when Dyer Engineering contacted us and said they wanted to look at their energy consumption and how it can be improved. “Many businesses don’t realise the vast savings they could make by changing what seems a small part of the business, like lighting. Once businesses start to see savings they want to find out more. “We’re now working with Dyer to look at improving the energy efficiency of its heating system. The Business Energy Efficiency Project launched in late 2016, working in partnership with Business Durham. The team provides free energy audits, advice and support to small businesses across County Durham. Some businesses may be eligible for grant funding. Businesses interested in finding out more can visit www.beep.uk.net or email beep@durham.gov.uk.